Every now and then a question pops up in the discussion forums about which MODs are most essential for board owners to install. It’s difficult to answer this question for one key reason; what is essential for one admin may be trivial to another. It all comes down to personal preferences and the unique needs of a particular bulletin board. Unfortunately, while this response is accurate, it still leaves enthusiastic new administrators without any answers. The purpose of this blog post isn’t to provide a definitive answer to the question, but more to provide something of a starting point for users beginning their search for suitable MODs… or something to munch on for the statistically inclined! Number of downloads is the primary piece of data used in the calculation of the statistics below. There is no way of knowing exactly how many times a MOD has been installed so the number of downloads is the best option available to reasonably estimate a MODs ranking in terms of total use in the wider community. Due to the overwhelming success of the Attachment MOD which provided functionality for file attachments in the early-to-mid 2000’s, Acyd Burn remains – and will remain for the foreseeable future – phpBB’s most downloaded MOD author. 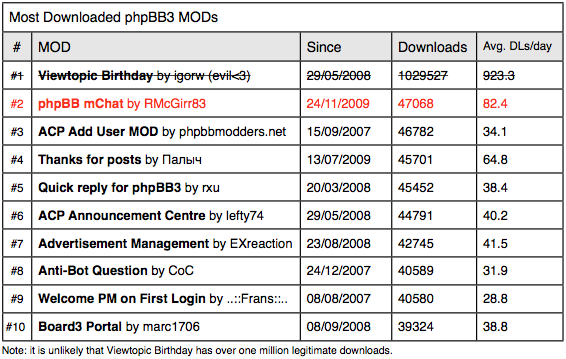 If anyone reading this is feeling nostalgic, you may also be interested in the ﬁgures for phpBB2 MODs. 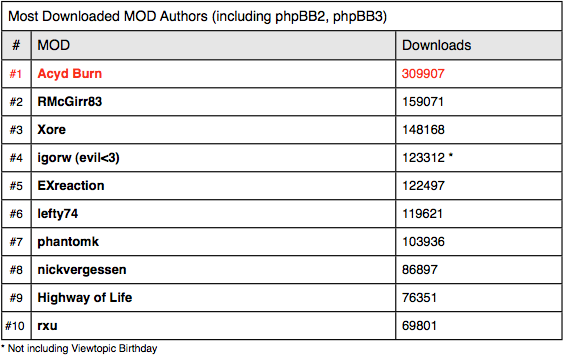 Quite conceivably (and conservatively), at its peak the Attachment MOD averaged over 200 downloads per day. All statistics are based on database entries up to June 18, 2011. Guest posting: Do I or don’t I? Whether you have just opened your forum or whether you have an established community, the thought has probably crossed your mind at one point or another of opening the board to guest posters. Obviously there can be no definitive right or wrong answer for everyone, but for most people the simple answer is “don’t do it”.